It’s taken a few months for me to sort through all of my wedding event photos and start putting them in albums. While doing this, I thought it would be fun to share some pictures and advice from one of my bridal showers. It was a very special shower because it was all of my closest girlfriends. It was only 2 weeks before the wedding and they hosted it at our new apartment – we moved in only 1 month before It’s always fun to have parties at your house, but not have to do all the work. I left the apartment in the mid-morning so that the girls could come over and decorate. When I walked into the apartment it was a total surprise. The house was glowing! Going with the nautical theme of the wedding the details of the decorations were fabulous. Simple, bright colored, and classy – nothing over the top or cheesy. If you are planning a bridal shower here are some tips for decorations. 1. Use sand in vases instead of water to create a beach feeling. Place different size candles in the sand for a unique glow. See pictures below. 2. Martha Stewart Weddings offers great ideas for decorating and templates for everything from invitations to paper flowers. Warning – you could spend hours on this website. 3. Don’t overdo the decorating sometimes the simplest decorations look the best. Although the decorations were simple at my shower they were classy and gave the room a festive feel. 4. Use food as a decoration as well. Although it won’t last long the way the food is presented is just as important as the decorations. Choosing the right color of foods can add to the appearance. Strawberries, blueberries, and of course whip cream are great colorful foods to use for a nautical themed event. 5. Most importantly have fun and get creative! 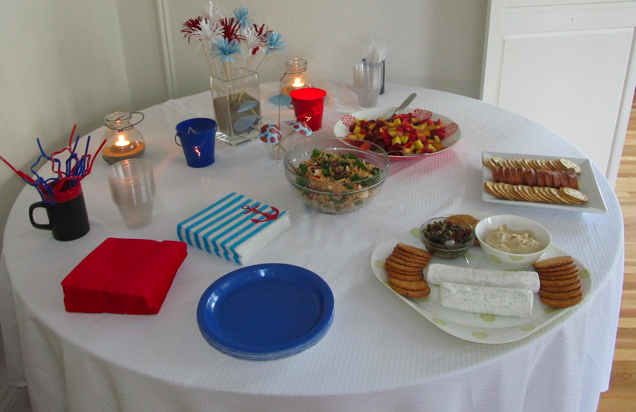 That red, white and blue star garland was so much fun to make! Hours of crafty fun and it was so worthwhile to surprise you with such a fun shower!